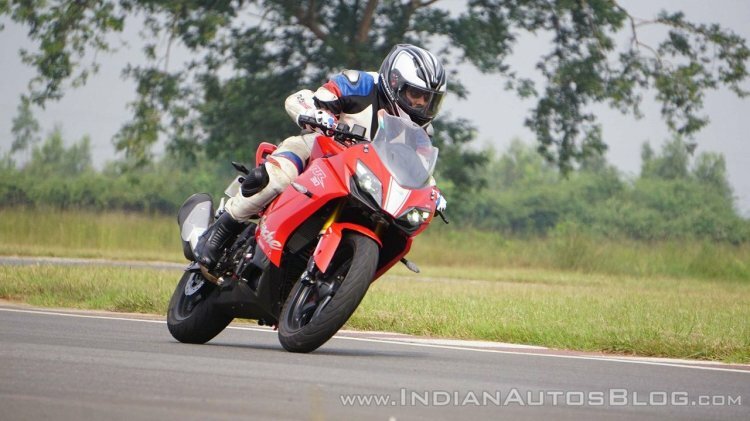 With an aim to offer better ownership experience, TVS Motor Company announced a complementary performance upgrade to all Apache RR310 motorcycles sold till date. The list of updates includes ECU remap and swapping parts like bar-end weights and chain roller on the company’s flagship motorcycle free of charge. An IAB follower had shared the information and the screenshot of the SMS from TVS Motor. Now, one of the owners of the TVS Apache RR310 has uploaded the video of the update on his YouTube channel, revealing the complete process. The new mapping for the ECU is said to enhance the performance of the motorcycle. For reference, the 312 cc reverse inclined, single cylinder, liquid cooled, 4-valve fuel injected (Bosch - Closed-loop EFI) engine on the Apache RR 310 delivers 34 PS of maximum power at 9,700 rpm and 27.3 Nm of peak torque at 7,700 rpm. The exact change in the performance figures is not available. Vibrations and the noise from the chain have been a cause of concern and to address the issues. The complimentary upgrade includes parts such as heavier bar-end weights and a chain roller. The new bar-end weights are designed to filter out the vibrations and offer a better ride experience. The chain roller is aimed to reduce the noise coming from the chain. The company would also provide a new rubber cushion pads for the visor. The TVS Apache RR310 missed its annual sales target by nearly 50 per cent for 2018. The company was able to sell just 5,297 units of its flagship motorcycle throughout the year, as against its goal of 10,000 units. The new upgrade is aimed to enhance the ownership experience of the existing customers and attract the attention of potential buyers in the segment. The TVS Apache RR310 has received a complimentary upgrade that includes ECU remap and installation of new parts like heavier bar-end weights and chain roller. However, with the increase in competition, it will be an uphill task. Do note that the Apache RR310 reported its lowest sales numbers in November and December. It is the same time when Royal Enfield launched its 650 Twins while Jawa made a comeback to the Indian market with the Classic and the Forty-Two.